We have created logos and developed identities for a variety of small and startup businesses, as well as for numerous community events, initiatives, clubs, and associations in our home city of Beverly, Massachusetts. We developed a school seal that was cast in terrazzo for the lobby of the new Beverly High School. The logo subsequently became the official school logo. Most recently, we came up with the tagline "Reimagine Rantoul" and designed a corresponding logo to highlight the rebirth of Rantoul St., Beverly's second "main street" (where our studio is located), which is in the midst of a major transformation from an industrial, automobile service, and dive bar strip to a transit-oriented residential, dining, arts & shopping destination. We are also adept at working with the existing corporate branding guidelines of larger companies. Wolters Kluwer, Lincoln Financial, UMass Lowell, and Pearson Education are examples of clients with strict branding guidelines that we have to interpret when producing marketing materials. Please contact us to discuss your logo, identity, or branding project. Rebranding campaign naming & tagline development; logo design. Develop new logo, branding for startup tech company. Logo design and development, art direction. Logo concept, design and development. Logo design. Terrazzo floor seal development. We design banners and posters for events and promotional purposes. 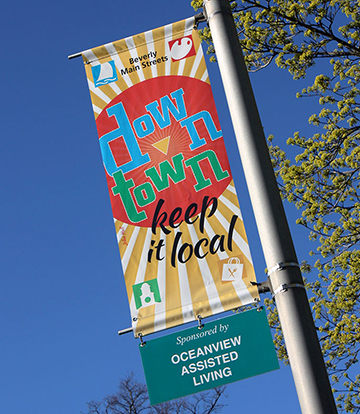 In 2013, our design for the downtown Beverly, Massachusetts banner program was selected as the winning entry in a competition sposored by Beverly Main Streets. The banners hung throughout the downtown area during the Spring and Summer. Other poster projects have included a series for the MacDowell Colony downtown arts program in Peterborough, New Hampshire, and a variety of banners for school auctions and special events. If you have any poster or banner project you'd like to discuss, please contact us. Design selected in a juried competition to hang throughout Downtown Beverly, Massachusetts in the Spring-Summer 2013 season.